First, the “superfast” method. You have an image area you want make a brush from it, to be used with a tool like pencil, airbrush... Select it with the rectangular (or elliptical) select tool, then do a Copy of this selection and immediately you can see this copy in the first position of the Brush Dialog, and its name is “Clipboard”. It is immediately usable. The second method is more elaborate. Do File → New with, for example, a width and a length of 35 pixels and in the advanced options a Color Space in Gray Level and Fill with: white. Zoom on this new image to enlarge it and draw on it with a black pencil. Save it with a .gbr extension in the directory /home/name_of_user/.gimp-2.8/brushes/. 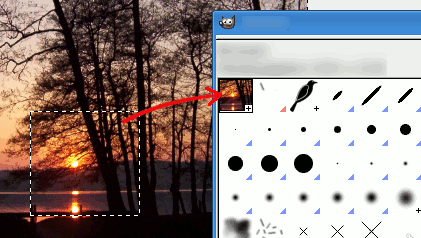 In the Brushes dialog window, click on the button Refresh brushes . And your marvellous brush appears right in the middle of the other brushes. 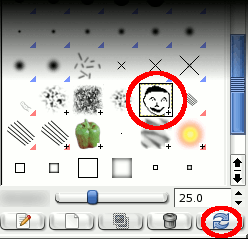 You can use it immediately, without starting GIMP again.